Goncharuk E.O., Getmantseva V. V. Andreeva E. G., Guseva M.A. Dr. of Eng. Sc., Prof.
Abstract: The article substantiates the need in developing methods for intellectualizing CAD software for clothing, presents the results of work aimed at developing the creative potential of the designer, describes the method of sleeve modeling developed by the authors, which allows to organize an active dialogue between the designer and the automated system in the process of designing new products. Keywords: constructive modeling, parametric designing of clothes, intellectualization, sleeve "flashlight"
The basic principles of intellectualization of the automated engineering process of clothing designs are theoretically determined on paper . However, in practice this issue has not been fully implemented. At present, the vector of CAD for clothes development is shifted towards the implementation of 3D graphics, leaving behind the «creative» specifics of the garment designer’s work in 3D space . 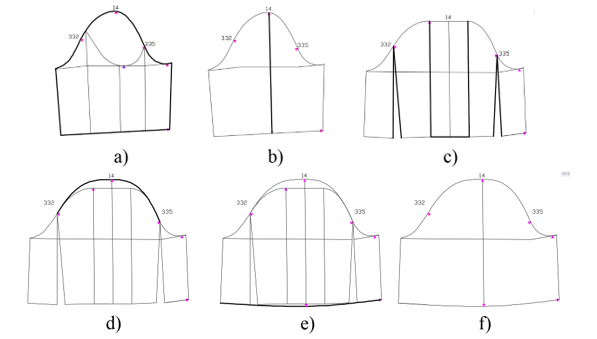 A study of the traditional manual modeling process of three-dimensional clothes was conducted to develop methods of constructive modeling of complex garments details in an automated intellectual environment. As a research subject, a short sleeve with pinches on the cap and the bottom of sleeve (sleeve-flashlight) was chosen. — an algorithm for constructing a design that allows to automate fully the stage of modeling was developed. 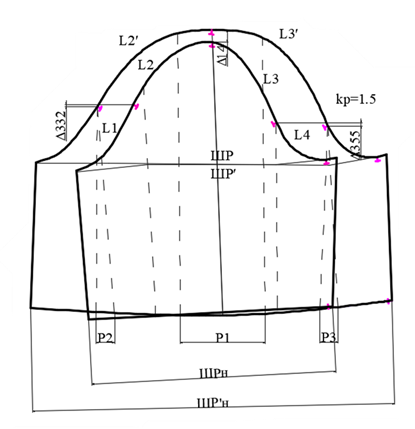 The system of parametric characteristics of the sleeve-flashlight construction contains the necessary information on the planar sweep and the volumetric form of the sleeves. The developed system of parameters is structured in accordance with the sequence of actions of the designer and the decisions made by him, while developing the models of clothing (Table 1, Figure 1). The developed system of parameters will be used in developing dialog windows of the software product and for creating the bases of recommended parameter values. Using intuitively understandable and detailed characteristics in the process of automated design will allow the designer to be immersed into a creative working atmosphere and to take into account all aspects of modeling as much as possible. 2. Technique of cutting. Eight hundred drawings of models, detailed drawings and visual diagrams / Lin Jacques; M .: RIPOL classic, 2009. — 592 p .: ill.
3. Modeling and designing of women’s clothing / Mueller and son; — 1 volume, Moscow: Publishing house «EDIPRESS-KONLIGA», 2008.-231 p .: ill.
— no recommendations are given for drawing a graphical contour of the sleeve construction. The revealed shortcomings of the methods exclude the possibility of their use for the development of automated algorithms. When developing a new algorithm for modeling a sleeve with pinches along the cap and the bottom of the sleeve, the shortcomings listed above were taken into account. The technique for constructing a sweep of a sleeve of a complex shape (Fig. 2) was developed on the basis of the parameters presented above (see Table 1). A special feature of this method is that it is completely mathematically describes all the stages of construction, which in turn makes this technique adapted for the automated design process. b. Calculation of the extension of the sleeve with accounting the coefficient of extension relatively to the length of the bottom (cuff) of the sleeve. The value of the coefficients varies kр = 1.1-2.5 (depending on the design project). By the notch 14 of the highest point of the cap of the sleeve, the BC is expanded in parallel for 70-75% with the extension P1. The remaining 25-30% of the expansion are conically expanded along lines parallel to the line of the warp thread of a sleeve drawn from 332 and 335 evenly on the back and front. Forming the bottom of the sleeve occurs along two guides, matching the front and back parts of the bottom after conical expansion. 1. Kiseleva M.V. Development of the parametric method of 3-D modeling of female belt products: dis. ... cand. tech. Sciences: 05.19.04 / M., MGUDT, 2011. - С45-61. 5. Boyarov Mikhail Sergeevich DEVELOPMENT OF THE METHOD OF PARAMETRIC DESIGN OF THE SPATIAL FORM OF MEN'S SHOULDER PRODUCTS: dis. ... cand. tech. Sciences: 05.19.04 / MGUDT. M., 2013. p. 74-81]. 6. Getmantseva V.V. Development of methods for intellectualization of the process of computer-aided design of women's clothing: dis. ... cand. those. Sciences: 05.19.04 / MGUDT. M., 2006. - P. 30 - 32.